Every year The Headwear Association asks Headwear Aficionados to name one style denizen our THA Hat Person of the Year. The voting is open for the Seventh Annual Headwear Association Hat Person of the Year. 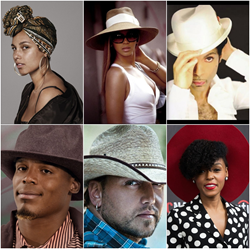 The 2016 nominees are Alicia Keyes, Beyoncé, Prince, Cam Newton, Jason Aldean and Janelle Monáe. Voting in the online global poll will close on December 10th, 2016. Previous Hat Person of the Year winners include Al Roker, Pharrell Williams; Kate Moss; Duchess of Cambridge, Kate Middleton; Johnny Depp and Brad Pitt. This year’s nominees were selected from more than 50 submissions from the THA membership, and the board narrowed the field to just six candidates. Who will be 2016 Hat Person of the Year? It’s up to hat fans worldwide. People can vote once daily, and be sure to enter your email to win one of the giveaway hats. The winner will be announced in December 2016 and honored at the 109th Annual THA Gala held in New York City at The Central Park Boathouse on Thursday, April 27th, 2017.